SublimeREPL is a plugin for Sublime Text 2 that lets you run interactive interpreters of several languages within a normal editor tab. It also allows connecting to a running remote interpreter (e.g. Clojure/Lein) though a telnet port. SublimeREPL has a built-in support for command history and transferring code from open buffers to the interpreters for evaluation, enabling interactive programming. This documentation is work in progress. Details on language integrations are sorely missing. Please contribute! Download Package Control, select Install Package and pick SublimeREPL from the list of available packages. You should have Package Control anyway. SublimeREPL adds itself as a submenu in Tools. You can choose any one of the preconfigured REPLs and if it’s available in your SYSTEM PATH , it will be launched immediately. Second and more user friendly way to launch any given REPL is through Command Palette. Bring up Command Palette and type “repl”. You will be presented with all preconfigured REPLs. Running REPL through Command Palette has exactly the same result as picking it from Tools > SublimeREPL menu. One of the most frequently reported errors is SublimeREPL not being able to find interpreter executable, even if it’s visible in your shell. There are several way to fix this problem that we’ll discuss in FAQ. You may now use a source buffer to either evaluate text from the buffer in the REPL or copy text over to the REPL without evaluation. For this to work, ensure that the language syntax definition for your source buffer matches the REPL. 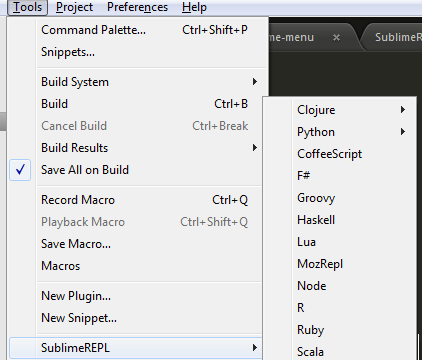 The default shortcuts shipped with SublimeREPL are listed below. If you are accustomed to another REPL keymap, or if you intend to work in REPL a lot (lispers pay attention!) you may want to rebind the keys more to your liking. The list below omits the trivial text editing keybindings (e.g. left, right etc). They are nevertheless configurable in keymap files. The keybindings here use Ctrl+, as a prefix (C-, in emacs notation), meaning press Ctrl, press comma, release both. Pressing the prefix combination and then the letter will immediately send the target text into the REPL and evaluate it as if you pressed enter. If you want to prevent evaluation and send the text for editing in the REPL, press Shift with the prefix combination. Default source buffer keys are identical on all platforms. Ctrl+, b Send the current “block” to REPL. Currently Clojure-only. SublimeREPL’s integration with a specific language includes language-specific main menu and palette options for REPL startup, keymaps, and special REPL extensions unique to the target language. An integration may contain several different REPL modes which are based on different underlying classes. The Clojure integration supports Leiningen projects. You must install Leiningen to use Clojure integration. To start a REPL subprocess with Leiningen project environment, open your project.clj and, while it is the current file, use the menu or the command palette to start the REPL. In subprocess REPL mode, the REPL is launched as a subprocess of the editor. This is the mode you should use right now. The telnet mode no longer works because of the changes in Leiningen and nrepl. The source buffer “send block” command (Ctrl+, b) deserves a special mention. Performing this command while the cursor is within the body of a definition will select this (current, top-level) definition and send it to the REPL for evaluation. This means that the latest version of the function you’re currently working on will be installed in the live environment so that you can immediately start playing with it in the REPL. This is similar to [slime -]eval-defun in emacs. Both stock Python and Execnet integrations support virtualenv. Various ways to work with Python, including PDB and IPython, are supported. Alternatively, more paths can be added to “python_virtualenv_paths” in the SublimeREPL configuration file. Documentation contributions from a Python specialist are welcome. The default SublimeREPL configuration documents all available configuration settings. SublimeREPL can’t launch the REPL process - OSError(2, ‘No such file or directory’), how do I fix that? I’d like an interactive REPL for Foo and it is not supported, what do? Chances are, you only need a minimal amount of work to add an integration, and necessary steps are described here briefly. If you already have an interactive shell for Foo, you can use the subprocess REPL. For an example, see PHP or Lua integration in config/PHP . If this is your first time dealing with Sublime plugins, you may find it a bit too magical. Basically, Sublime automatically scans plugin directories loads configuration files and plugin code without manual intervention, and reloads them dynamically as soon as they change. The entry points to a plugin’s code are its commands, which are Python objects that extend Sublime’s standard command class. Sublime calls them when needed. There is no initialization entry point or a “plugin loaded” callback or somesuch. 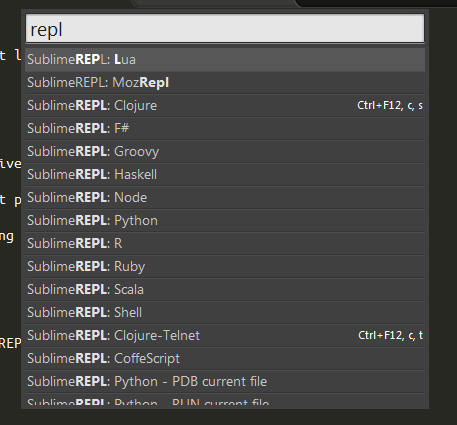 REPLs are started by SublimeREPL command repl_open . The command and its arguments is usually specified in the menu configuration file, and the other places refer to that configuration item by file name and ID using the run_existing_window_command command. Simple language integrations use an existing REPL class (see below) without modification. For these integrations, no additional Python code is needed. They use one of the standard REPL classes as the base, as documented below. In most cases, this will be the subprocess based REPL class. An example of such an integration is Lua. This adds a “Lua” menu item to “Tools > SublimeREPL” which creates a Lua REPL via SublimeREPL command repl_open . The important part to take note of here is the id attribute ( repl_lua ). This is the ID by which the command palette configuration file refers to Lua REPL configuration. As you can see, the main way to launch a new REPL is the SublimeREPL command repl_open (class ReplOpenCommand). The menu configuration file (see above) specifies the arguments for the command that are used to locate the desired REPL class and the settings for it so that it can be spawned. This command is a wrapper that is used in the command palette configuration. Its function is to execute another command. It takes an ID of a configuration item and the name of a file where the configuration is stored, and scans the available Sublime configuration folders for the file and within the file for the configuration item until one is found. This allows the command palette configuration to specify a reference to the REPL configuration command instead of replicating it. For this reason, actual REPL configuration is concentrated in the menu files. Class TelnetRepl. The process runs outside of the editor, presumably having been spawned externally, and the REPL connects to it over TCP via Python telnetlib . Class PowershellRepl. This is only used by PowerShell integration. Class SublimePythonRepl. A REPL over SublimeText’s internal Python interpreter. All these can be found in the plugin’s repl/ subdirectory. Read and return some bytes from REPL’s incoming stream, blocking as necessary. ReplManager will set up a separate thread with a ReplReader pump that keeps polling this method. Write some bytes to REPL’s outgoing stream. User input in the REPL view’s command line will be delivered here. User interaction causes the execution of repl_open command. Its arguments are usually taken from a menu configuration file. Within the ReplView constructor, the read and write loops get started. The REPL is now alive. Creating and remembering a named ReplView instance that couples between the two. A ReplView instance is a coupling between a REPL instance and a Sublime view. Its main responsibility is to create Sublime views and maintain the loops that read from, and write to, the REPL. The outgoing data is written into the REPL by ReplView’s method py:method: update_view_loop . This method is called by ReplView’s constructor at the very end and, as long as the associated REPL object is alive, will reschedule itself with Sublime’s py:method: set_timeout . © Copyright 2012, Wojciech Bederski. Revision d17e8649.